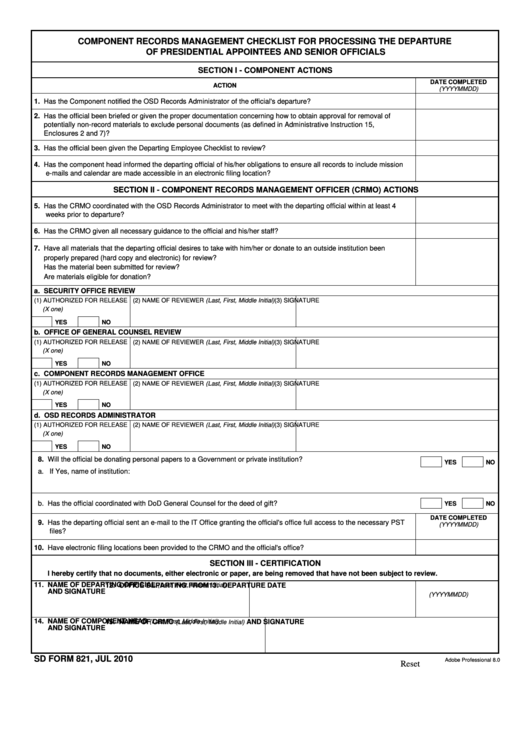 Download a blank fillable Sd Form 821 - Component Records Management Checklist For Processing The Departure Of Presidential Appointees And Senior Officials in PDF format just by clicking the "DOWNLOAD PDF" button. Complete Sd Form 821 - Component Records Management Checklist For Processing The Departure Of Presidential Appointees And Senior Officials with your personal data - all interactive fields are highlighted in places where you should type, access drop-down lists or select multiple-choice options. 1. Has the Component notified the OSD Records Administrator of the official's departure? 3. Has the official been given the Departing Employee Checklist to review? e-mails and calendar are made accessible in an electronic filing location? 6. Has the CRMO given all necessary guidance to the official and his/her staff? properly prepared (hard copy and electronic) for review? Has the material been submitted for review? Are materials eligible for donation? 8. Will the official be donating personal papers to a Government or private institution? b. Has the official coordinated with DoD General Counsel for the deed of gift? 10. Have electronic filing locations been provided to the CRMO and the official's office? I hereby certify that no documents, either electronic or paper, are being removed that have not been subject to review.